Born 24 August 1879, Pollokshaws, Scotland. A revolutionary socialist and leading member of the Red Clydeside movement. 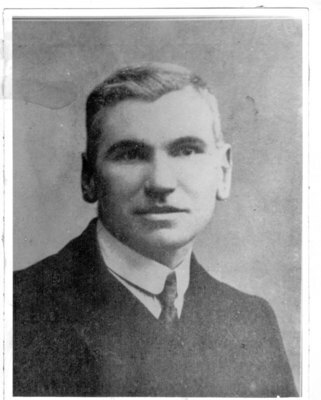 A revolutionary socialist of international standing, John Maclean was an honorary president of the first Congress of Soviets and appointed by Lenin as Bolshevik consul for Scotland. 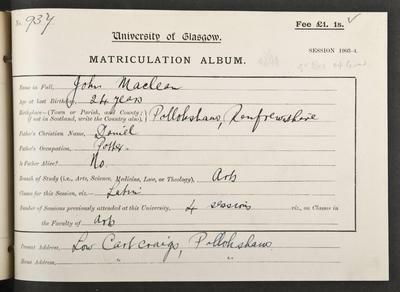 John Maclean (1879-1923)was a Glasgow graduate who became a revolutionary socialist, a teacher, and the most famous of the Red Clydesiders. A bitter opponent of capitalism and imperialism, he dedicated his life to Marxist revolution and the cause of the working classes. He was born in 1879 in Pollokshaws. Although his father died young his mother was determined that John would have an education. He trained as a teacher through the Free Church and studied part-time at the University of Glasgow from 1898 to 1904. He included Education and Political Economy in his Arts curriculum and graduated MA in 1904. He taught at Lorne Street School, but spent most of his free time running classes in Marxist Economics and History for trade unionists, workers and activists. When he was convicted under DORA in 1915 the Govan School Board sacked him and he devoted himself wholly to activism. James Maxton was a fellow student at Glasgow and shared platforms and causes. He was sent to prison three times during the war for offences under the Defence of the Realm Act and sedition. His political work continued after the war and he was imprisoned again twice in 1921, after outdoor meetings advocating action. 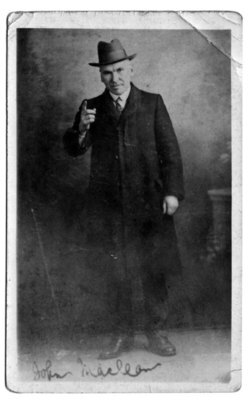 His Scottish Workers' Republican Party contested Glasgow by-elections in 1923 but failed to achieve mass support. Prison life, hunger strikes and force feeding took its toll and he died on 30 November 1923, aged forty-four. He remains a hero in the history of the left, celebrated in song, poetry and plays.